Ladakh Expert – Foremost resource for traveling to Leh-Ladakh. Heavy snow accumulation, bad weather, and damaged roads are making things difficult for BRO’s Project Himank to clear the Manali – Sarchu Highway of snow and restore road connectivity to Ladakh. BRO had originally set a target of 25th May, for the Manali – Leh Highway to be reopened this year. While Project Deepak, responsible for clearing the Leh – Sarchu stretch has managed to clear the highway of snow till Sarchu. Project Himank, which is responsible for clearing Manali – Sarchu stretch, has managed to clear the road till Baralacha La and is now working hard to reach Killing Sarai. BRO is confident of clearing the stretch within a week and after a couple of days of maintenance work, they expect to officially reopen the Manali – Leh Highway for vehicular traffic. All those heading to Manali can now breathe a sigh of relief, you can now travel to Rohtang Pass and see and play in the snow. Until now, tourists were only allowed to go till Marhi and beyond that, only locals could travel. However, now that a 200 car parking lot has been constructed amidst snow at Rohtang Pass. District Administration feels, it is time to let the tourists travel up to Rohtang. Each day 1,200 vehicles (800 petrol and 400 diesel) will be allowed to go up to Rohtang Pass for tourism. Additional 800 vehicles will be allowed to cross Rohtang Pass in order to travel to Lahaul, Pangi, Spiti and Ladakh. Permit for both is available online at http://admis.hp.nic.in/ngtkullu and since there is a lot of demand for a permit to travel up to Rohtang Pass and a limited number of permits each day, half the permit will be issued online between 12 pm to 3 pm and rest between 5 pm to 12 am. For those wondering about the status of Manali – Leh Highway, the highway is closed as of now. However, it is expected to reopen fairly soon with the last stretch of the highway being cleared of snow at Baralacha La. Intially road conditions will be fairly poor, so all those planning to head to Ladakh, please plan accordingly. 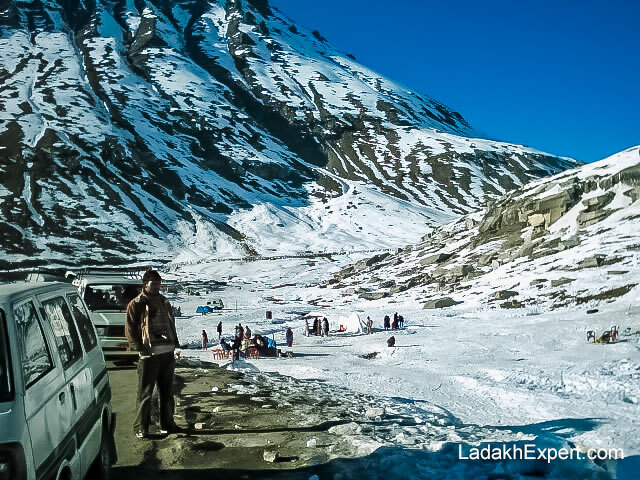 For travelers heading to Ladakh, Spiti, Lahaul and Pangi Valley from Manali, Manali Administration has made life a little easier by putting the permit for crossing Rohtang Pass online. Until now, you could get an online permit for Rohtang Pass, only if you were going to Rohtang Pass for tourism. If you were planning to go beyond Rohtang Pass, you had to get the permit from SDM Office in Manali or from the Gulaba Check Post. 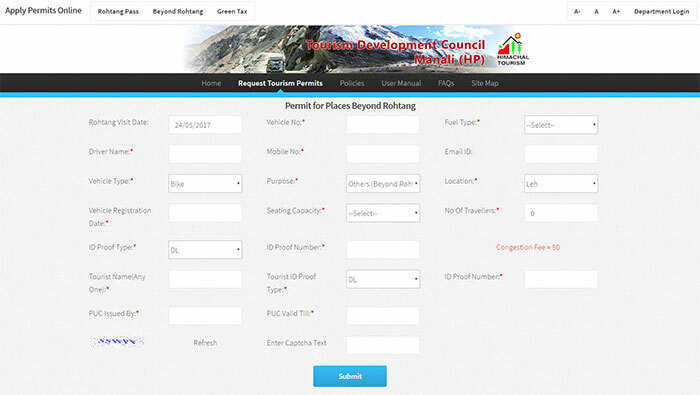 Now you can get this permit online, by visiting the following URL, http://admis.hp.nic.in/ngtkullu/BeyondRohtang/InformatoryScreen. The permit would be issued to a maximum of 800 vehicles per day and that includes motorcycles, cars, passenger vehicles and goods vehicle. Since the permit can only be obtained 2 days in advance, it is a good idea to book it as soon as you can, in order to avoid a headache later. Motorcycles, cars and passenger vehicles will have to pay Rs. 50 congestion charge for obtaining the permit, while goods vehicle will have to shell out Rs. 100. Vehicles which are 10 years or older, will not be issued permit i.e. you cannot cross Rohtang Pass from Manali side. However, if you’re coming back from Leh, Spiti, Lahaul or Pangi, there is absolutely no issue and you should be able to cross without any restriction. New for this year is the restriction on issuance of a permit on Tuesday. Until last year, tourism activity at Rohtang Pass was banned on Tuesday, due to it being dedicated to maintainence of Rohtang Pass. However, vehicles heading beyond Rohtang Pass were allowed to ply on the highway, early in the morning and late in the evening. It remains to be seen, if similar measures are put in place this year as well or if Tuesday becomes a complete no-go day for Rohtang Pass. People who are planning to outsmart the system by getting a permit for crossing Rohtang Pass and then returning from Rohtang Pass after having fun i.e. use it as a Rohtang Tourism Permit will have their vehicles blacklisted and likely a fine too would be imposed on them. Since this permit is strictly meant for vehicles going beyond Rohtang Pass. You need to be fairly careful while filling the above form because in case your documents do not match the details in the permit application, you will be turned back from the Gulaba check post. Overall a welcome move by Manali Administration, though it remains to be seen if the plan to limit number of vehicles crossing Rohtang Pass has a negative impact on tourism and causes headache to travelers this season. Srinagar – Leh Highway has officially reopened for 2017 with the J&K government allowing light vehicles to ply on the highway from today onward. After an initial trial run by the army on 7th of May 2017, 25 light vehicles carrying essential commodities and 1 vehicle carrying a medically critical individual was allowed to ply on the highway on 9th of May 2017. Since then, light vehicles carrying essential commodities and taxis carrying locals were plying on the highway. For the next couple of weeks, there is fairly high chance of avalanches or snowfall closing the Zoji La temporarily for a day or longer. Road condition too would be extremely poor and the road is fairly narrow as well due to heavy accumulation of snow. For all those planning to travel to Ladakh in the next few days, it is best to be extra cautious while crossing the Zoji La and have a few buffer days in hand to deal with any temporary closures. Despite higher than normal snow accumulation this year, efforts are in full swing to reopen the Manali – Leh Highway on time. And now BRO believes, they will be able to reopen the Manali – Leh Highway by the 25th of May 2017. 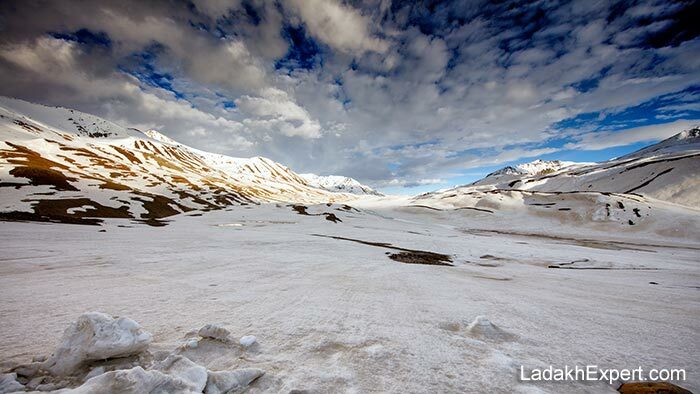 Last year the Manali – Leh Highway had reopened on the 22nd of May. BRO team is currently working on clearing the road to Baralacha La from Manali side and has managed to reach the army base of Patseo. Even though distance between Patseo and Baralacha La is mere 30 km, it will likely take 3 weeks for the BRO to clear the road and widen it enough for vehicular traffic. Baralacha La is the last pass to reopen on the Manali – Leh Highway and is also the toughest pass to reopen for BRO thanks to the heavy blanket of snow that covers it during winter. Just like in the case of the Rohtang Pass, two BRO teams work on clearing the Baralacha La, one working from Manali side and another from Sarchu side. There is no word yet on the progress of the BRO team, which sets up its base in Sarchu, after clearing Lachulung La and Nakee La. Apart from Baralacha La and the road connecting it to Sarchu, 17,480 ft Tanglang La remain the primary challenge for the BRO to reopen Manali – Leh highway for vehicular traffic.